Astronomers report the first detection of matter falling into a black hole at 30% of the speed of light, located in the center of the billion-light year distant galaxy PG211+143. The team used data from the European Space Agency's X-ray observatory XMM-Newton to observe the black hole. This is the characteristic disc structure from the simulation of a misaligned disc around a spinning black hole. A UK team of astronomers report the first detection of matter falling into a black hole at 30% of the speed of light, located in the centre of the billion-light year distant galaxy PG211+143. The team, led by Professor Ken Pounds of the University of Leicester, used data from the European Space Agency's X-ray observatory XMM-Newton to observe the black hole. Their results appear in a new paper in Monthly Notices of the Royal Astronomical Society. Black holes are objects with such strong gravitational fields that not even light travels quickly enough to escape their grasp, hence the description 'black'. They are hugely important in astronomy because they offer the most efficient way of extracting energy from matter. As a direct result, gas in-fall -- accretion -- onto black holes must be powering the most energetic phenomena in the Universe. The centre of almost every galaxy -- like our own Milky Way -- contains a so-called supermassive black hole, with masses of millions to billions of times the mass of our Sun. With sufficient matter falling into the hole, these can become extremely luminous, and are seen as a quasar or active galactic nucleus (AGN). However black holes are so compact that gas is almost always rotating too much to fall in directly. Instead it orbits the hole, approaching gradually through an accretion disc -- a sequence of circular orbits of decreasing size. As gas spirals inwards, it moves faster and faster and becomes hot and luminous, turning gravitational energy into the radiation that astronomers observe. The orbit of the gas around the black hole is often assumed to be aligned with the rotation of the black hole, but there is no compelling reason for this to be the case. In fact, the reason we have summer and winter is that the Earth's daily rotation does not line up with its yearly orbit around the Sun. Until now it has been unclear how misaligned rotation might affect the in-fall of gas. This is particularly relevant to the feeding of supermassive black holes since matter (interstellar gas clouds or even isolated stars) can fall in from any direction. Using data from XMM-Newton, Prof. Pounds and his collaborators looked at X-ray spectra (where X-rays are dispersed by wavelength) from the galaxy PG211+143. This object lies more than one billion light years away in the direction of the constellation Coma Berenices, and is a Seyfert galaxy, characterised by a very bright AGN resulting from the presence of the massive black hole at its nucleus. The researchers found the spectra to be strongly red-shifted, showing the observed matter to be falling into the black hole at the enormous speed of 30 per cent of the speed of light, or around 100,000 kilometres per second. The gas has almost no rotation around the hole, and is detected extremely close to it in astronomical terms, at a distance of only 20 times the hole's size (its event horizon, the boundary of the region where escape is no longer possible). The observation agrees closely with recent theoretical work, also at Leicester and using the UK's Dirac supercomputer facility simulating the 'tearing' of misaligned accretion discs. This work has shown that rings of gas can break off and collide with each other, cancelling out their rotation and leaving gas to fall directly towards the black hole. Prof. Pounds, from the University of Leicester's Department of Physics and Astronomy, said: "The galaxy we were observing with XMM-Newton has a 40 million solar mass black hole which is very bright and evidently well fed. Indeed some 15 years ago we detected a powerful wind indicating the hole was being over-fed. While such winds are now found in many active galaxies, PG1211+143 has now yielded another 'first', with the detection of matter plunging directly into the hole itself." He continues: "We were able to follow an Earth-sized clump of matter for about a day, as it was pulled towards the black hole, accelerating to a third of the velocity of light before being swallowed up by the hole." 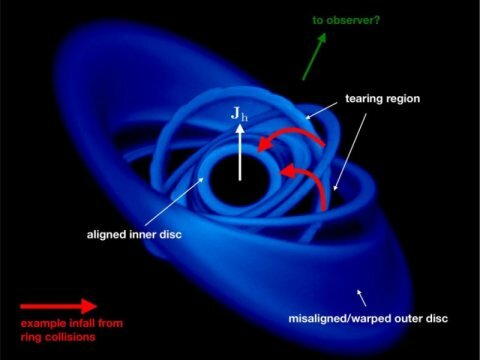 A further implication of the new research is that 'chaotic accretion' from misaligned discs is likely to be common for supermassive black holes. Such black holes would then spin quite slowly, being able to accept far more gas and grow their masses more rapidly than generally believed, providing an explanation for why black holes which formed in the early Universe quickly gained very large masses.